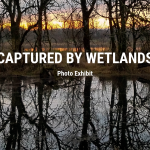 Join us for the kick-off of American Wetlands Month and celebrate the opening of Captured By Wetlands photo exhibit. The photo exhibit is a compilation of 20 photos from the last three years of photo contest. We can toast to our May adventures, enjoy some snacks and meet the photographers. We hope to see you there! !